Have you ever wanted to commission a bespoke piece of jewellery, artwork, product, garment from a designer, maker or artist but don’t know how to go about it? Here are my top tips for commissioning a piece of work. 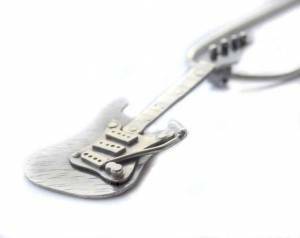 This is specific to jewellery but some aspects can be transferred into other disciplines. It’s worthwhile to take time to research the right person to make your new piece. Chances are you have saved up to get something special so you need to choose the right artist, designer or maker to turn your idea into reality. Some designers do not like to take on commissions as they can be challenging, stressful, time consuming and the designer may not be comfortable making something different to their own work. 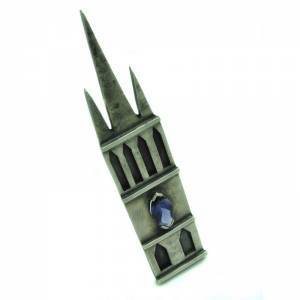 They may just have their own collections of jewellery and only make things in their own style. It may be out of their own skill set and knowledge so they may not know how to make what you want them to do. So you need to make sure you choose a designer who is experienced in making bespoke commissions or is happy to take them on. You need to choose a designer who’s designs a style you like. Even if you have your own idea the designer may add their own influence to the piece making it unique from any other designer. Once you have chosen the designer who is happy to take on a commission and you like their style you can contact them directly,via email to arrange a consultation. When you commission a designer it’s good to realise how specialised their skills are, how precious their time is and not just think of it as the value of materials involved. 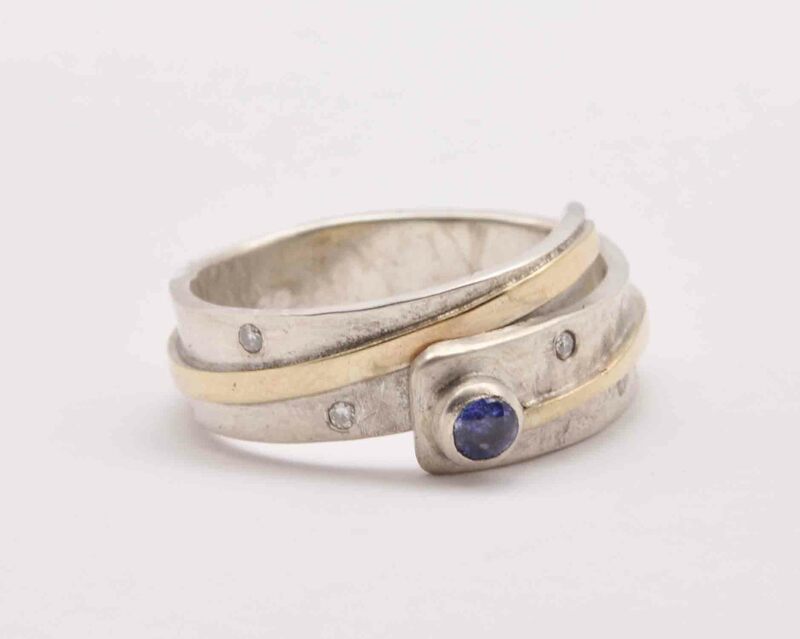 Taking on commissions is a challenge for the designer and allows them to come away from making their own jewellery and allows them to push their skills further. However time is precious to a designer and commissions take a lot of time, so always allow the designer to have enough time to make the piece. Every designer is different but most commissions can take between 3-8 weeks depending on the work load and how complicated the design is. Some designers specialise in high end pieces and it can take months just to make that one piece. If a commission is rushed or you put a lot of pressure on the designer to get the piece completed in a short period then you may not be happy with the final result. Like the Guinness quote “good things come to those who wait”, so be patient and allow the creative process to flow. At the first stage it’s best to contact the designer via email to make sure they are happy to take on the commission and create your special piece for you. A prime example of what NOT to ask is ”I’d like a ring made in 18ct gold with a diamond, so how much would it cost?”, this is far too vague and there is much more to consider than the basics. It takes time to work out the cost of a commission. The designer needs to first of all design the piece with dimensions, size and type of stones, in order to work out how to charge correctly. They must know your budget and timescale. Precious stones vary a lot in price so if you only have a budget of £600 for instance, then you are not going to be able to get a platinum band with lots of high quality diamonds. Letting the designer know your budget allows them to source the right grade of stones and type of metal to fit your budget. You need to be realistic with what you can afford and what can be made in your budget and time scale. If you need it for a special date, make sure you tell the designer. They will need to source the right stones and materials before they can make the piece and this can take time if it’s something quite rare. 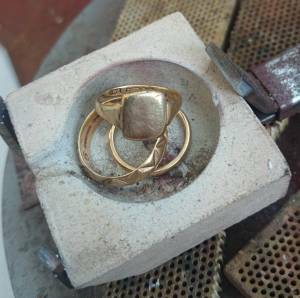 Once the piece is made it gets sent away to the ‘Assay Office’ to be Hallmarked. This part of the commissioning process allows between 3-7 working days for Hallmarking the piece (it could possibly take longer depending on how busy the assay office is). This is the stamp to prove to you, the consumer, that it is made in precious metals. It also has the makers mark, the date stamp and the Assay Office stamp. For more information about Hallmarking visit the Goldsmiths Company or The Assay Office Scotland website. If you are searching around and just wanting the best price then you shouldn’t get a designer maker to make your piece. You need to value their time and skills so don’t expect them to lower their price to make you the commission. When you choose your designer you need to understand that the piece will be completely unique to you and no one else will make the piece in the same style. Sometimes I get approached by people whom have looked online and seen a design that they like but can’t afford the big label. So they therefore enquire if I can make it for cheaper, this is simply not possible. It is illegal and against copywriting law to make a replica of a brand design. Chances are that the design you have seen has been mass produced, designed and made in CAD (computer aided design), rapid prototyped or cast. Therefore it is not a one off piece and has not been handmade. If the designer was to make it by hand it would actually cost more as it would be time consuming to make. However, if you have found a design that you like online or in a shop, what designers can do is to take influence of the design and tweak and change elements to make it their own design but they can not replica a Tiffany ring. Thank you for taking the time to read this blog. If you are thinking of getting a unique piece, or bespoke piece of jewellery made but you don’t know where to start then I hope this has helped. I prefer to be contacted by email initially then like to arrange a face to face appointment with my clients to meet me at my studio. 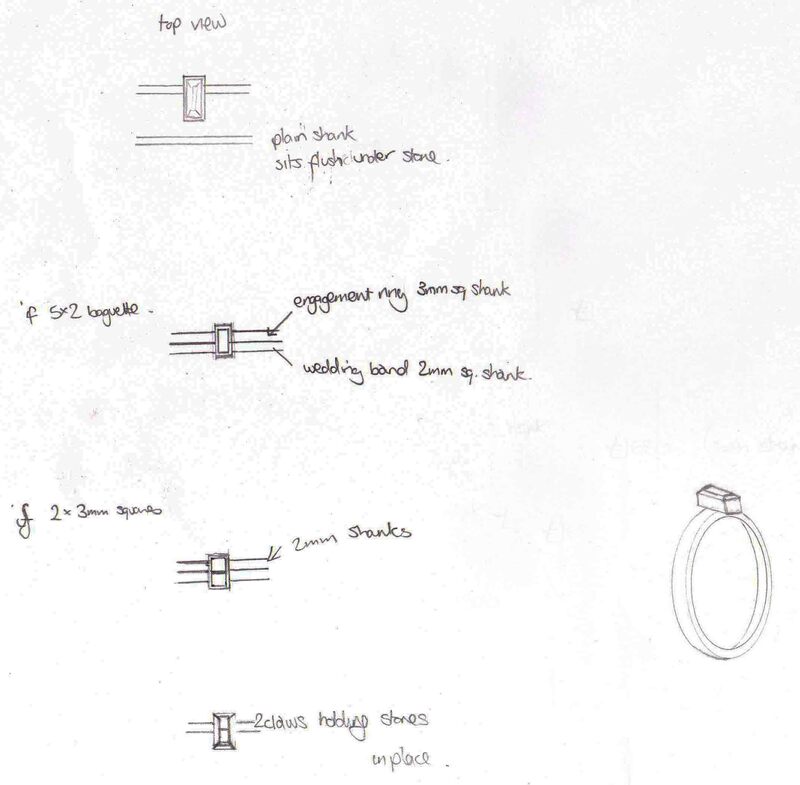 When I am designing a bespoke piece of jewellery, it is designed specifically for you, the client, so I like to get know a little bit about you and your style before I can design that special piece for you. If you don’t live in locally and can not come for an appointment, don’t worry as we can liaise via email or Skype. I will ask you to fill in a consultation form before we meet so I can have an idea of what you want and this allows me to prepare and get the most of our consultation. 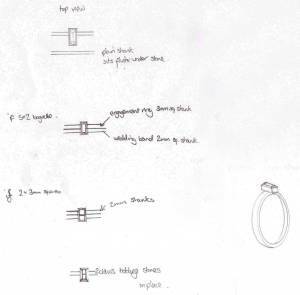 If you have your own ideas I would ask you to bring along some pictures or sketches of jewellery you like or email these with the filled in consultation form. If you want me to design the piece for you these images will be my starting point to get to know you and will give me inspiration to design your piece. If you don’t have any ideas and want me to design it for you this is no problem, all this can be discussed at the consultation. I charge a £50 non refundable design fee which has to be paid upfront if you are wanting me to design the piece for you. Once this is paid I can go away and design a piece for you based on what was discussed at our consultation. I can then email you sketches or we can arrange to meet again to go over the designs. Once you are happy with the designs, materials, and we have agreed on budget and timescale, I require 50% deposit up front and the final payment is made on collection. It can take between 3 to 8 weeks to make the piece. If you have a specific date you want the piece by please discuss this at the consultation. 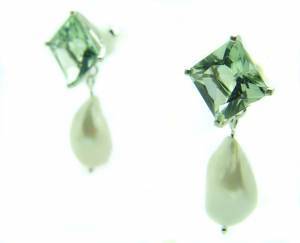 Once your item is ready I will email you to arrange an appointment to return to the studio to collect your new jewels. If you are not based in Dundee all of this can be done over Skype and /via email so don’t worry if you can’t get through to meet me at my studio. I have had clients that I have never met face-to-face, the power of technology! If you can not collect your finished piece of jewellery, it can also be posted by special delivery to you. I hope this has helped to explain the process and has answered some questions about commissioning a unique piece of jewellery. If you are interested in getting something made or have any queries, do not hesitate to get in touch.